Posts Crucial Parts of Your Business You Can’t Neglect! 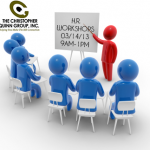 Utilize Best Employment Practices and Minimize Liability! Attend all four and save! Register Now! All sessions are 9:30 am – 12:30 pm. Refreshments Provided. The majority of our teleconferences are accredited for continuing education credit, including continuing legal education. Please note that program duration may not reflect credit hours. Each attendee seeking continuing education credit must purchase an individual registration. A unique personal identification number will be assigned to each registrant to electronically track attendance for credit reporting purposes.